by Tony Perkins: Donald Trump has spent his career in real estate, and yesterday he became the sole owner of the GOP's most valuable property: the Republican nomination for president. Late last night, delivering a speech few thought possible, the question of Hillary Clinton's opponent was formally settled, after what will almost certainly go down as one of the most unpredictable seasons of presidential politics in history. Just before midnight, balloons and confetti rained down on stage, closing out a significant two-week stretch for the GOP. To the relief of conservatives, it was a stretch that included the strongest statement of principles by a Republican platform to date. Against all odds (and even more Establishment money), a coalition of pro-family groups led by FRC Action beat back the attacks on our values and emerged with a document more clear and compelling than any in party history. Regardless of what the media might make out of this week's program, the GOP platform -- not the Convention's speakers -- is what guides the party, and we were proud to help lead the charge in firmly planting the flag for life, marriage, and religious liberty in the planks of the GOP's governing document. Long after the streamers are cleaned up and the delegates have gone home, that will be the legacy of this Convention. And thanks to your support, we helped shaped that legacy. As even the New York Times pointed out, these past two weeks would have been very different had we not been involved. But the GOP platform wasn't the only place where social conservatives played a prominent role. On the final night of festivities -- while some were beating the tired drum of evangelicals' waning influence -- I was invited to speak. Despite the obituaries the press continues to write about our movement, it was a visible reminder that pro-family conservatives continue to influence the Republican Party by being a witness for transcendent and unchanging truths. It was such a significant moment, in fact, that The Hill included it in its five reasons for the Convention's success. After leading the audience in the Pledge of Allegiance, I had the opportunity to talk about what makes that tradition so meaningful. From the Christian Post to the Washington Times, the media agreed: offering evangelicals such a primetime spot on the program spoke volumes about the direction of the party. "Christianity Takes Center Stage at the Start of the Final Night of Trump's Convention," the Daily Caller headline read. We will continue to work to ensure the concerns and values of families across this nation remain a key part of the policies, debates, and months leading up to November. Tony Perkins is President of the Family Research Council . This article was on FRC Action and as a DISCLAIMER: Tony Perkins was speaking in his personal capacity and not on behalf of any of the nonprofit organizations he leads. 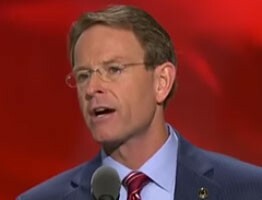 Tags: Tony Perkins, speaker, 2016, National Republican Convention, GOP Platform, pro-family conservatives, life, marriage, religious liberty, planks of the GOP's governing document To share or post to your site, click on "Post Link". Please mention / link to the ARRA News Service. and "Like" Facebook Page - Thanks!